Drive better outcomes across the clinical, operational and financial aspects of your business. 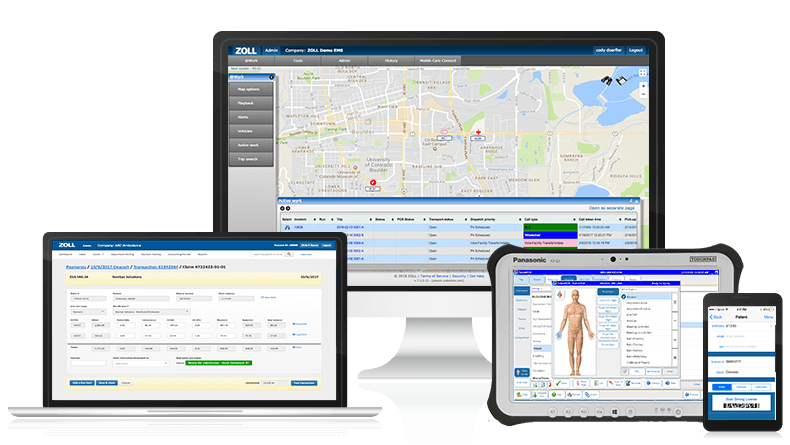 Save more lives, operate with maximum efficiency and optimize payment revenue with ZOLL software solutions covering the span from dispatch to discharge. Are you an EMS agency looking to effectively manage daily operations? Are you a fire department looking to effectively manage daily operations? We exist to support your life-saving efforts by providing data management solutions focused on improving outcomes across the clinical, operational, and financial aspects of your business. Capture the right data at the right time, and then easily distribute that data to your back office, so that you can focus on providing the highest quality of care. Get the right resources to the right location at the right time with a Dispatch solution that enables you to streamline call-taking and dispatch while reducing response times, making your entire operation more efficient. Optimize revenue through the efficient collection of all required data. Super charge your accounts receivable (AR) with the industry’s most advanced billing solution. With full control over what data gets collected, patient information can be aggregated into meaningful and predictive data. ZOLL gives us another tool in the arsenal to meet our response times, adjust to system demand, and keep your system working and adjusting on the fly. Being able to send claims associated with poor credit directly to collections allows our billers to focus on claims that are more likely to be paid in a timely manner, which ultimately saves us money. On top of no major incidents since implementation, we’ve consistently seen a steady decrease in maintenance costs – a 15 percent decrease from the previous period the last time we ran the numbers – as well as a decrease in fender benders. With RescueNet FireRMS, each apparatus is able to document exactly what they did on scene and give an account on when they were dispatched and how long they stayed on scene. These details allow outside entities, such as our fire investigation unit or insurance companies, to see what was done, why it was done and determine what had happened. Check out the ZOLL Pulse blog to learn from industry experts on how you can improve operational, clinical and financial outcomes.